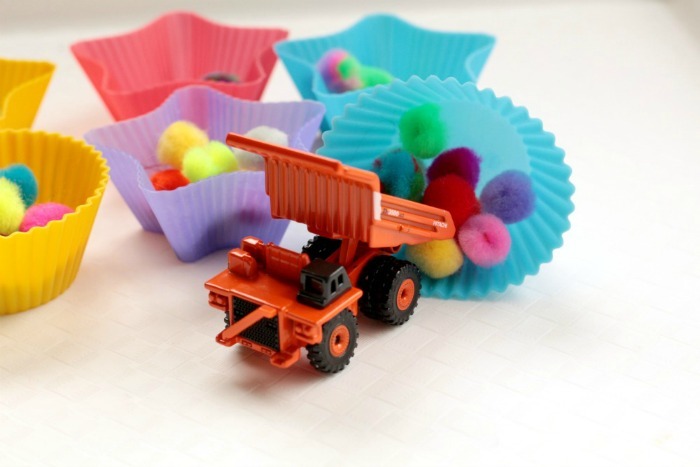 Kids love playing with dump trucks and cars. 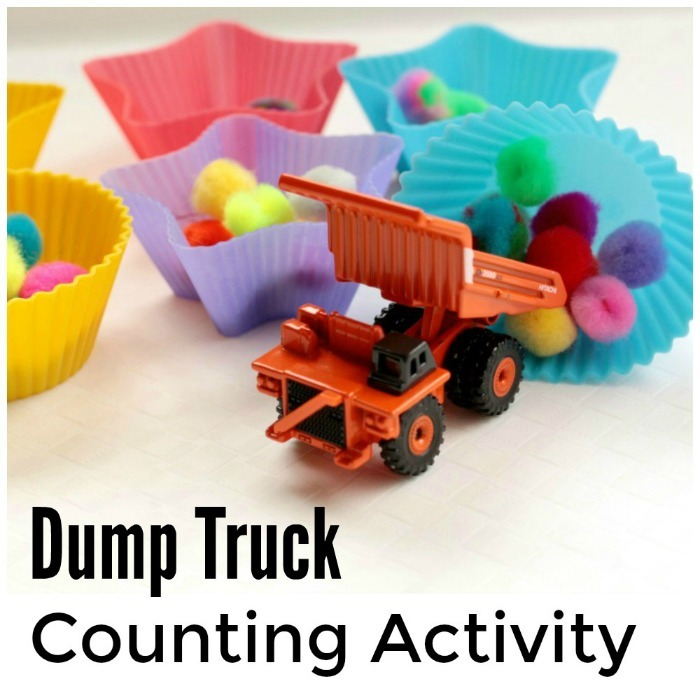 Make the activity sneakily educational with a dump truck counting activity that helps them practice their fine motor skills and counting at the same time! 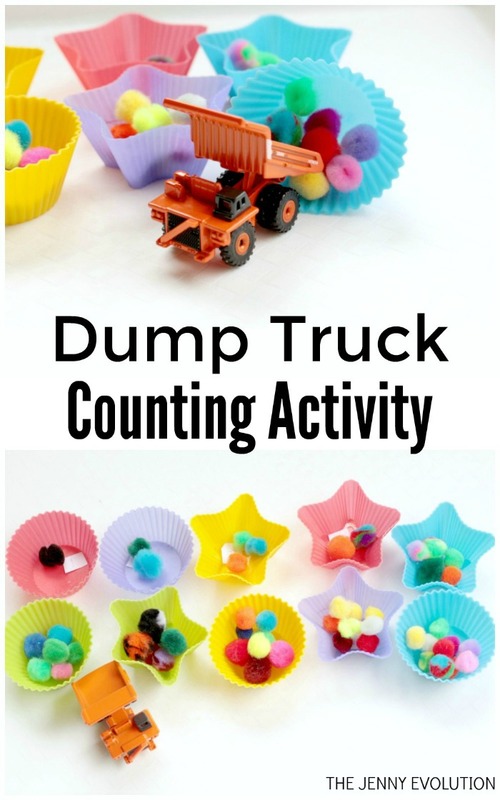 Use this activity to solidify counting skills, sorting skills, fine motor skills, simple addition and subtraction, and more! There are nearly endless variations to try with this activity. This post contains affiliate links. 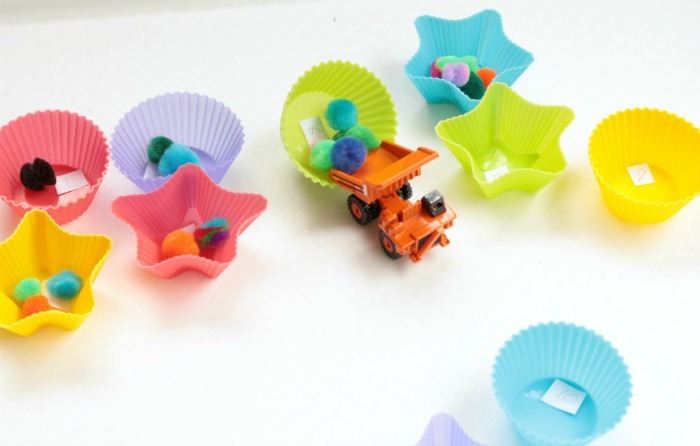 Little ones will love picking up pom poms in their truck and dropping off the right number at each station. This activity will keep kids entertained for hours and is the perfect rainy day activity when kids are stuck inside. 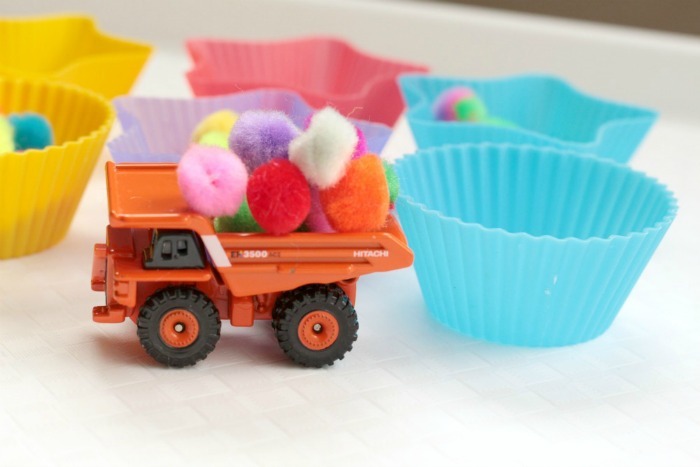 Follow these steps to set up your own dump truck counting station! Kids will ask to do this activity over and over. Before starting the activity, write the numbers from 1-10 (or you can go higher if you are working on those teen numbers!) onto little slips of paper and place one piece of paper in each cup. If you don’t have any cups, you can just draw little circles on the ground and put the paper numbers inside each circle. 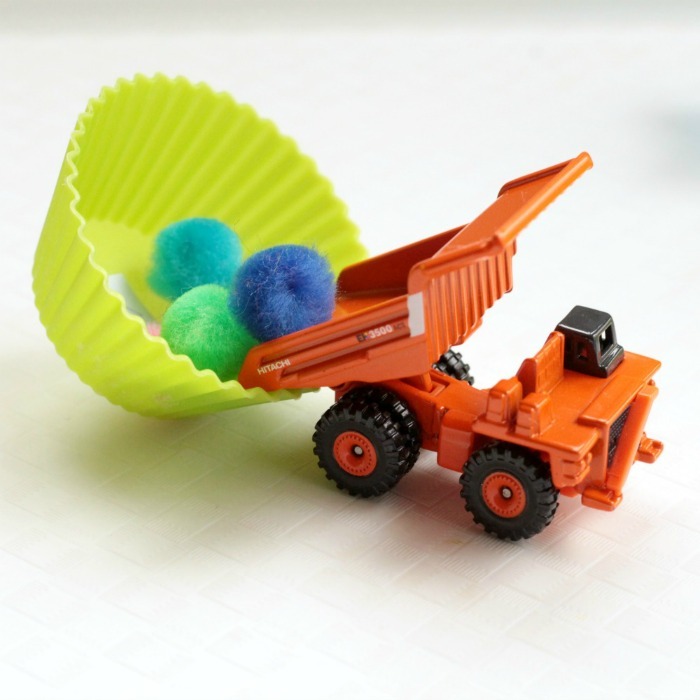 Show the kids how to scoop up the right number of pom poms to drive the dump truck to the appropriate station and drop it off. It’s so much fun to learn to count when dump trucks are involved! For older kids, you can easily translate this activity into simple addition and subtraction. 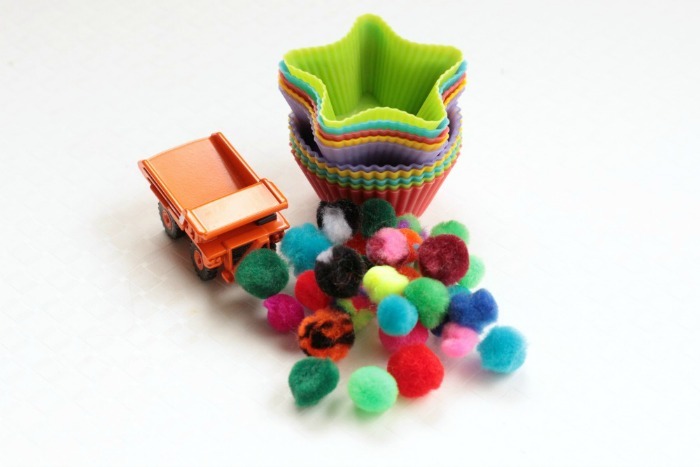 Tell the kids to remove a certain number of pom poms from a cup, then count how many are left. 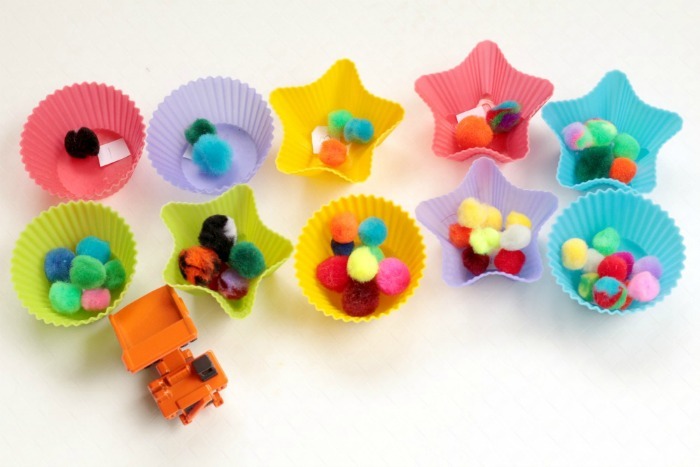 Drive multiple loads of pom poms to each cup, then count how many pom poms you have altogether. 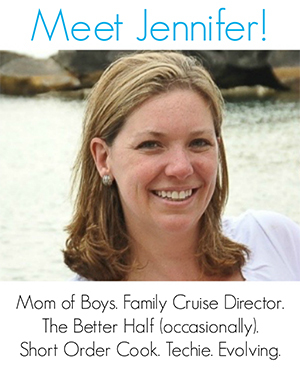 It’s a lot more fun than just filling out a paper worksheet!